In recent years, the Foundation has worked to expand the kinds of programs we conduct for the public, to appeal to a variety of interests. These programs have included art classes, theatrical events, music events, events for dog lovers, storytelling for families, events for runners, egg hunts, Halloween events, and, or course, Party in the Park, our annual fun and fundraising event. Please see our calendar to find out what is in the works for this year. For information on our programs, contact us at programs@bridletrails.org. 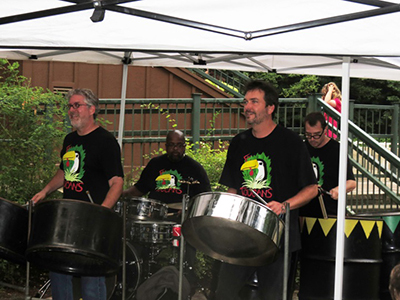 Check out videos of the Toucans Steel Drum Band, kids dancing to the Toucans, and the Cascade Mountain Boys Bluegrass Band.